Outdoor lighting can illuminate your home’s best features and make outdoor living in the spring safer and more enjoyable than ever! There are a vast number of reasons to invest in outdoor lighting for your property. These range from aesthetic benefits to safety and security boosts. This spring, think about complimenting and enhancing the natural beauty of your home with outdoor lighting. It can make all the difference for late night entertaining. 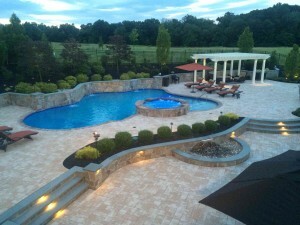 You work hard to maintain an impressive home, and these are some of the reasons outdoor lighting is a necessity for it. Outdoor lighting adds atmosphere and beauty to your home when done well. Proper lighting will enhance the beauty you have worked hard to cultivate, and increase the resale value and curb appeal of your home. On top of these important practicalities, how enhancing the visual aspects of your home makes you feel cannot have a price put on it. Imagine how you will feel after arriving home from a long day at work to see your home and lawn softly illuminated and lit up in the most welcoming way. Guests will feel just as welcome. Homes with outdoor lighting generally sell for more than those without it for a number of reasons. The beautified appearance, practical safety applications, and charming ambience of outdoor lighting inspires people to spend more on a home with this tastefully done landscaping feature. Burglars generally choose homes which appear to be easy targets, as this lessens the chance of them being apprehended. Houses that appear empty or are not well lit are generally the most attractive to various criminal types. Dark pathways and side yards attract them while a well-lit home without dark corners deters robbers and increases security. People are far more likely to trip and fall in the dark than they are in a well lit area. This is especially important to consider if you ever have guests over late at night, particularly older guests. Homeowners are legally liable for any accidents which occur on their property, so this can be a smart step to take to lessen injury risks. This entry was posted on Thursday, April 7th, 2016	at 10:14 pm	. You can follow any responses to this entry through the RSS 2.0	feed. Both comments and pings are currently closed.